Zero Dropouts (ZD) is an educational social enterprise, with a national scope, founded in Colorado in 2011 by educator and social entrepreneur, Steve Dobo. The philosophy of ZD is grounded on the belief that all students have the ability to be successful in education and life. ZD focuses on supporting the continuum of education, from elementary through to post-secondary and on to college completion. 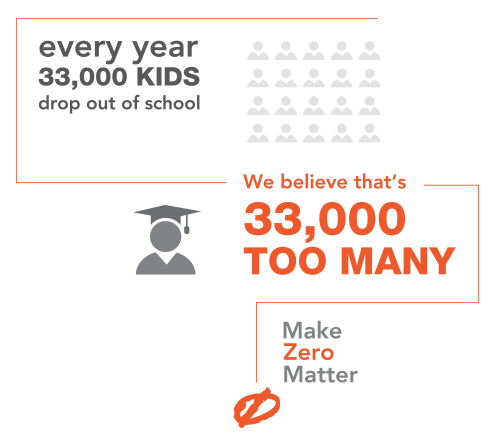 Zero Dropouts understands that schools and school districts are embedded in communities and require comprehensive, full-service solutions. We strive for collaborative approaches—paired with strong partnerships—in order to create sustainable solutions that build the capacity of the communities served. This work would not be possible without the important relationships formed with the community, students, school districts and administrators. Hearing the voice of community members, parents, and students is essential to arriving at inclusive and effective decisions. Our process includes using intensive local data analysis, combined with national research and research-based strategies that guide ZD’s assessment and implementation strategies while focusing on driving the key school and district metrics of annual dropout rates, on-time graduation rates and post-secondary enrollment rates.